There are those among us who have every intention of getting – and using – a planner at the beginning of the year, but for one reason or another life things come up and it just doesn’t materialize. 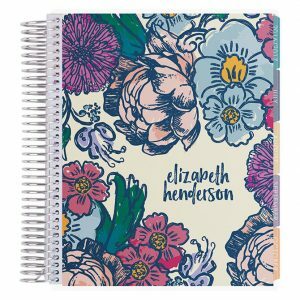 Many planner companies began to realize that it isn’t always realistic to sync your own planner ambitions with a typical calendar-focused planner, so they began creating undated products that allow you to essentially work at your own pace. 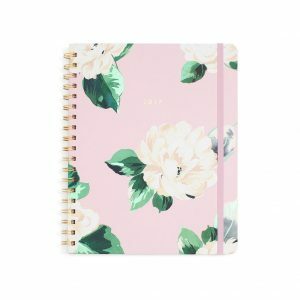 Below, we’ve rounded up some of the most popular and best undated planners for those looking to get organized, but don’t want to wait around for the next dated organizers to be released. So whether you’re starting in January or July, there’s never a bad time to get the personal organization structure you need to be more productive. “I think my self has gotten a little better,” writes Mike Hickerson, after about 6 weeks of using the SELF Journal from BestSelf Co. The SELF Journal is an ambitious notebook whose goal is to “align the tactical day-to-day tasks with larger life goals,” and according to most users, the journal accomplishes its mission: the company’s page has (at the time of this writing) nearly 600 reviews, many of which give the journal 5 stars. The founders of the journal found that planners focusing on 12 months were often too overwhelming for users to follow through with, so they made the SELF a 3-month planner, making it easier to stick with over time. The 3-month approach has been copied by many journals, notebooks and planners now, but SELF was one of the first products to really innovate in this area. The 3-month approach allows you to focus on a long-term goal without losing the importance of daily wins and details. The book is technically broken up into 13 one-week periods, and each week offers a framework for reaching your longer term goals. This approach helps you keep your “why” front and center instead of getting lost in the minutia of lists and endless to-dos. In this way, the SELF Journal is more about habits than anything else. But for those of you who have a difficult time committing to using a planner each day, the journal’s undated format makes it easy to use without feeling like you’re falling behind because you missed a day or two. In fact, when I used the planner, I found that I could miss a week or more (look, I have twins), and when I came back to the journal, it still felt like I was moving in a positive direction because I wasn’t faced with a week of empty (and seemingly unproductive) days. The SELF Journal is made for those who have hectic lives and need to focus daily goals and long-term destinations. Each day’s page offers a space to plan activities, jot down what you’re grateful for, what your long-term goal is and things learned that day. It’s a great format that forces you to use the planner throughout the day instead of just once at night. One of the more subconsciously powerful aspects of the journal is the daily reminder to write down your goal. Dilbert creator Scott Adams, in a podcast with Tim Ferriss, said that he believes in the power of repetition and hypnosis when it comes to self-motivation, and each day’s space for rewriting your goal in the planner helps remind you to keep your eyes on the prize. Many users actually leave the planner on their nightstand or somewhere else that they’ll see right when they wake up and right before bed. This approach helps you get in the habit of habit, which is where the SELF Journal can really make a difference in your life. The SELF Journal pushes habit, reflection, gratitude and constructive days in a way that doesn’t feel forced or unnatural. And when you start to get in the habit of using the journal, it can be hard to stop. It was one of the few planners I’ve had in my life that I was able to keep up with, and for that reason it comes highly recommended as one of the best undated planners on the market. For a slightly toned down motivational undated planner, consider the Panda Planner. It uses a similar layout to help you keep track of your time and productivity throughout the day, but offers daily, weekly and monthly review sections that are a little more open-ended when compared to the above planner. The Panda Planner claims to use “scientific strategies set forth to improve productivity & happiness,” and part of this is achieved by focusing on your morning review and end-of-day review. 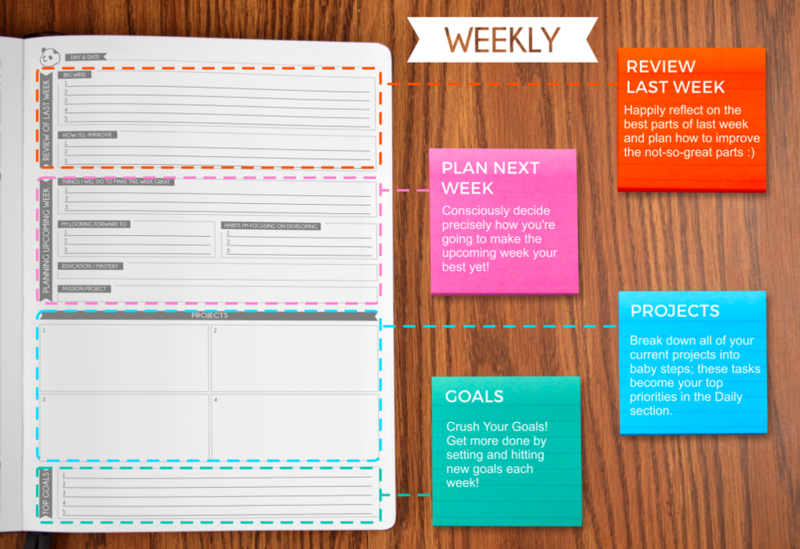 In between, the Panda Planner allows you to list priorities, schedule tasks and list notes. Where the SELF Journal focuses on bringing the long-term into your daily life, the Panda Planner gives you more space to plan your day and take notes on your progress. If you’re the type that needs to constantly remind yourself of your why, the SELF Journal may be a more suitable option. If, however, you want a simple undated planner that manages your day-to-day and month-to-month in a productive way, you’ll find the Panda likely to meet your needs with ease. “Priority list really helped me to name my top 5 things to accomplish for each day,” writes Amy at Miss Amyxo, and Corinne over at Wondermom Wannabe enjoys the “plenty of space to set priorities, evaluate progress, and plan for the future,” even considering the planner’s compact size. The Panda Planner is also particularly useful for those who do find the long-range planner effective (compared to 13 weeks for the SELF Journal), and if you’re good about sticking to planners at is, you may find the Panda even more useful. For some users, the SELF Journal is a little too much structure and motivation. 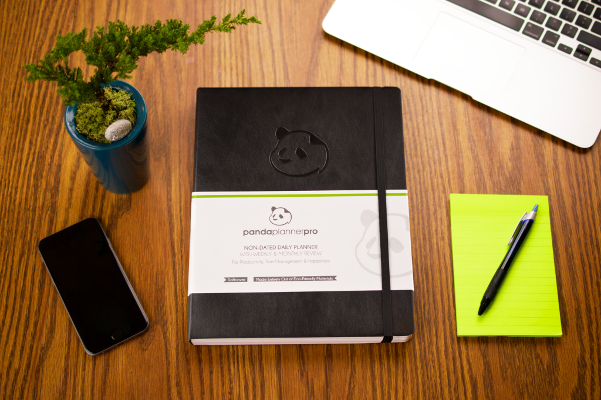 For a more relaxed undated planner vibe, the Panda offers simplicity and comfort without seeming underwhelming. With ebook bonuses and a no-questions money-back guarantee, Panda shows that they’re committed to their users’ success. The planner has some of the most passionate, loyal followers in the organization space and for that reason it’s one of our top choices. Herein lies the beauty of undated planners. By having to initiate the dates yourself, planning becomes a more assertive task. 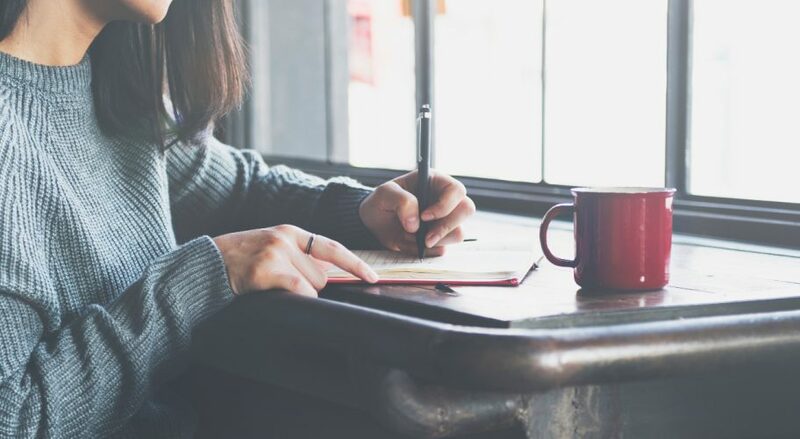 Instead of simply playing along with the dates you’re given, you have the opportunity with an undated planner to take more of a role in the actual use of your planner. 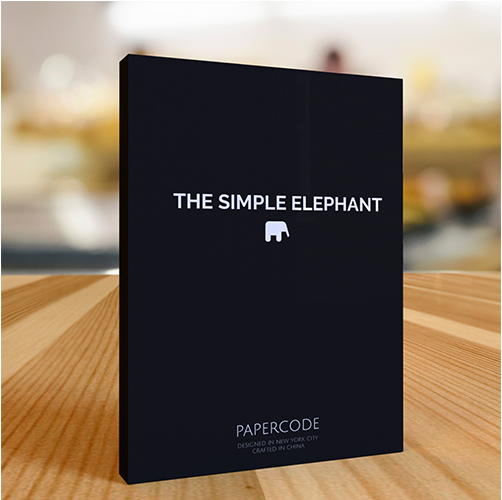 With space for affirmations, goals, gratitude lists and more, the Simple Elephant makes it easy to juggle life goals with daily to-dos in a way that makes you feel productive and confident in your abilities to get your stuff done. Mindmap, vision board and notes sections of the journal give you the freedom to let your mind wander and create; so while many journals focus entirely on a structured setup, the Simple Elephant helps both with constructive formatting and creative outlets. 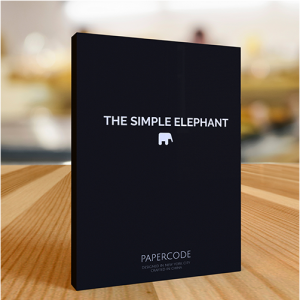 With an inner accordion file, helpful bookmark and quality-bound exterior, the Simple Elephant holds up over the year, so it’s as durable and stylish as it is productive. There are those of us with our head in the clouds and those with feet on the ground. 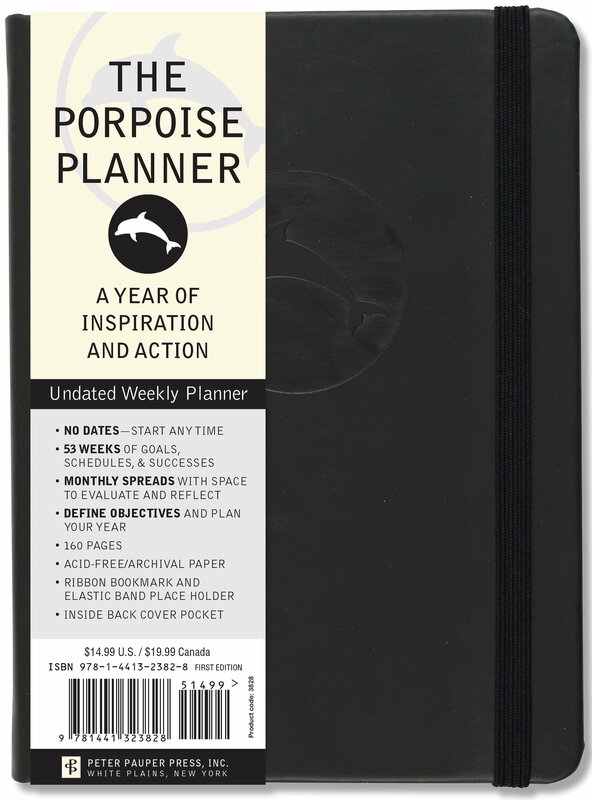 Somewhere in the middle we find the Passion Planner, a wonderful undated option for those who want the ultimate focus on their passion projects and goals. “I think the Passion Planner is an excellent tool for someone interested in a more structured option geared towards mindful goal setting,” writes Jen at Pretty Neat Living. The Passion Planner offers the structure of most planners with a few motivating additions, including a passion roadmap that asks the question: if I could be anything, do anything or have anything, what would it be? The answer, of course, is to be worked out in the pages and leaves of the Passion Planner. The roadmap offers a helpful timeline to break your big life goals into smaller steps, and we found the layout helpful in organizing our own personal goals. 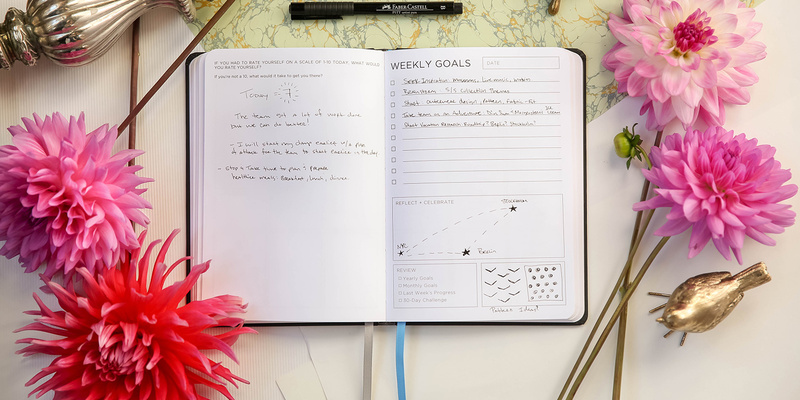 Weekly reviews offer a way to tackle your week’s focus and “good things that happened,” making the Passion Planner one of the less sentimental gratitude journals we tested. Each month’s review section includes helpful areas to break up your goals into personal and work projects, which we found helpful for those who work on a lot of side gigs beyond their full-time 9-to-5 jobs. Each planner is hand-inspected for quality before getting shipped out within a few days of ordering. 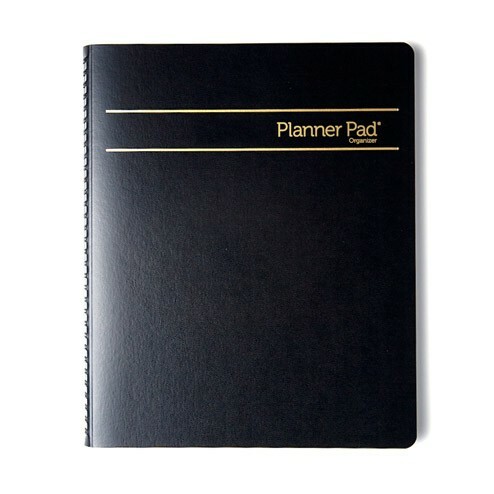 The planner is available in a classic, minimalist black in either regular or compact size, and users will find its one of the better feeling planners on the market. 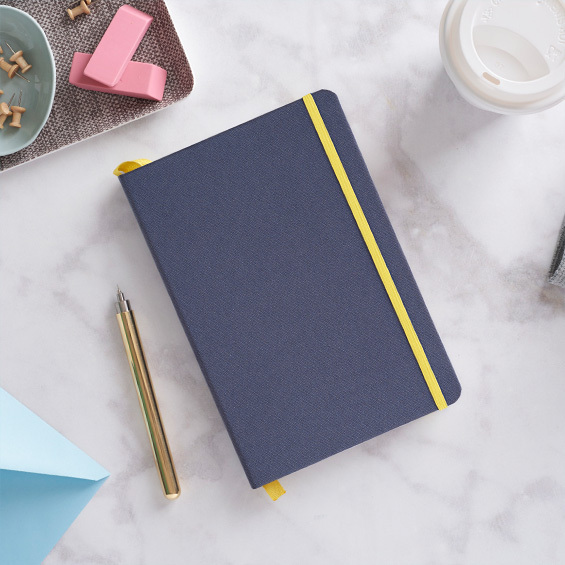 With a vegan-friendly faux leather cover and super high quality paper, you’ll feel like you’re working with something substantial when you bust this thing out at the beginning and end of the day. Its lay-flat construction makes it easy to use on a desk or table, though it’s flexible enough to keep up with the rigors of your daily routines. Helpful sections like reflection questions at the end of each month help you keep on track through the days and weeks, and we also found areas like the “no to do” list particularly useful and unique – sometimes it’s the stuff you decide you won’t do that makes you most productive, and this approach made the Passion Planner one of our favorite undated products out there. John Lee Dumas is the host of EOFire, a podcast that’s hosted more than 1,500 interviews with entrepreneurs and business owners. 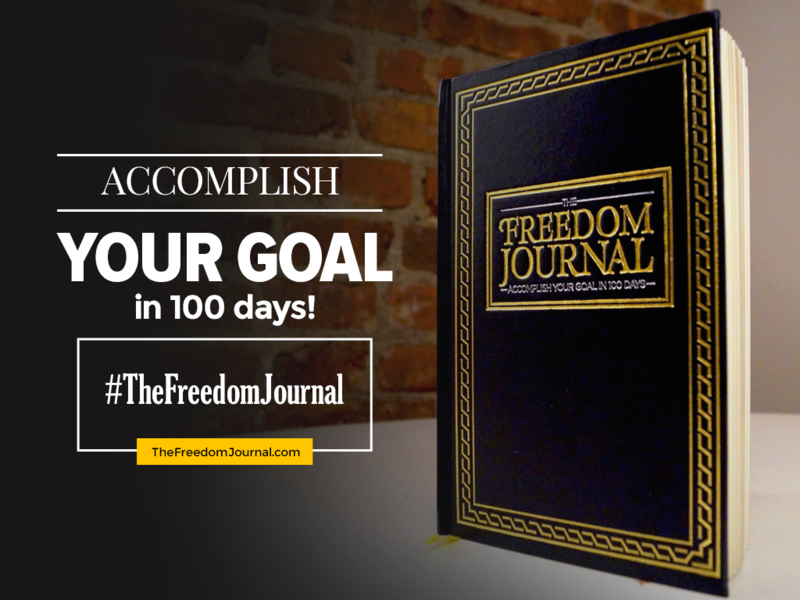 After taking all the advice and information he’s collected over the years, Dumas released The Freedom Journal, a way to accomplish one goal in 100 days. 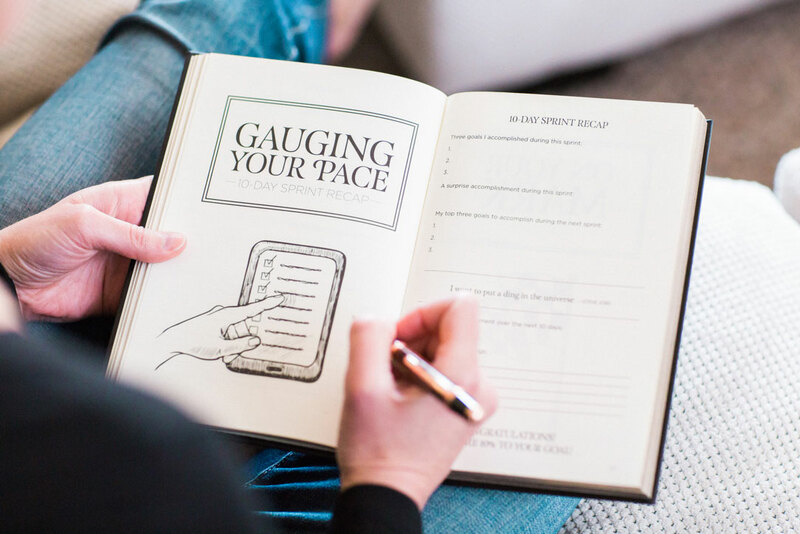 Accountability and absolute focus is the name of the game with The Freedom Journal, so if you have a difficult time committing to one goal at once, you may find this planner’s laser-like focus helpful. Since the journal’s release, thousands of people have found it helpful, and Dumas maintains an income report on his website that says the journal sold more than $25,000 worth in March 2017. The journal’s reputation is stellar beyond Dumas’ own site, however: 96% of all Amazon reviewers for the product left a 5-star rating. With a one-year guarantee and scientifically-backed format to produce results, The Freedom Journal is one of the most viral undated planners available today. The journal’s focus on achieving your goal within 100 days makes it similar to the SELF Journal in that it takes a shorter timeline when compared to a typical 12-month planner. To break things up even further, the Freedom Journal offers 10-day micro-timelines that allow you to gauge your progress. One of the things that stands out with The Freedom Journal is its physical presence: unlike a small, flexible planner that can be easily ignored, this journal’s solid hardcover makes it something of unique substance. The design and flow of the journal encourages continual use, and it’s no wonder that users find it easy to go along with the exercises and thought-generators. The journal relies on the SMART process, which claims that your goal must be smart (S), measurable (M), attainable (A), relevant (R) and time-bound(T). This 5-part approach makes it easy to visualize and take practical, actionable steps toward your goal. There’s very little fluff in The Freedom Journal: it’s all about accountable processes that make your goal a logical conclusion to the habits you’ve put in place within your 100 days. And if that’s not enough, your purchase of The Freedom Journal helps fund school construction projects in developing countries around the world. The Volt Planner began when Kate Matsudaira created a Kickstarter campaign to birth the planner she had always wanted. There must have been others like her: the initial $14,000 goal was easily surpassed and the campaign eventually generated more than $138,000 in funds. Since then, Kate and her team have spent countless hours perfecting their products, and the result of those labors is the undated Volt Planner. Like the dated version, the Volt Planner combines the best of both worlds: daily and weekly scheduling with long-term life-mapping. There are 6-months worth of prompts in the notebook, and the undated calendar and notes sections make it easy to maintain no matter when you start. The first part of the planner is all business: daily, weekly and monthly reviews and outlook sections make it simple to organize your time and responsibilities. The second half is more open-ended, with a notes section that includes perforated pages for those times when you need to tear things up a little. Throughout the life-planning section of the Volt Planner you’ll find 30-day challenges, weekly goal sections and other features that help you focus on what really matters over the course of your days and weeks. While other journals may include more “gratitude” sections, the Volt Planner gets down to nuts and bolts with strong, actionable sections that keep you grounded and focuses on practical progress in your life. Available in 4 colors, the Volt Planner is a sturdy, eco-friendly product with a vegan-approved cover and high-quality pages that won’t leak, even if you’re using a fountain pen. And if you are – good on you. In an age of hectic chaos and a sometimes mind-numbing focus on results, the 100-Day Happiness Planner is a refreshing reminder to do what makes you happy, not necessarily the most productive. “Since little, I dreamed of having my own inspirational brand that people love – where I get to write to inspire and design beautiful inspirational products that help people cultivate happiness and foster personal growth,” says Mo Seetubtim, the founder of Happiness Planner. And her goal has become a success: thousands of people each year buy Happiness Planners because they too have grown tired of the uninspiring nature of many journals and planners. 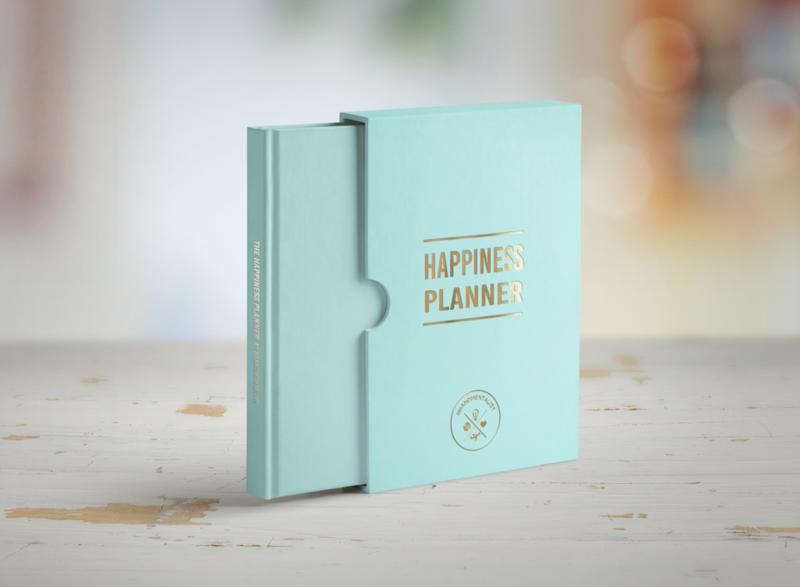 The Happiness Planner is a positive person’s dream notebook: full of prompts, quotes and motivating exercises to get you in the mindset that joy and positive fulfillment are more important than checking of your daily to-do list. On the other hand, the planner still offers daily, weekly, 100-day and yearly reviews that allow you to focus on real goals and milestones in your life. The planner relies heavily on gratitude, mindfulness and self-reflection in a way that gets you out of the daily rut of mindless checklists and into the frame of mind that says: you are lucky to be here. Seetubtim has created a planner that ultimately helps people figure out what matters in their lives, and create a life plan that encourages more of it and less of the hassle that ultimately leaks into our daily lives. The 100-day focus makes it easier to find manageable goals and chunks of time to make changes in your life, and for those looking to move beyond the 100-day template, the Happiness Planner is also available in a traditional dated format. It’s available in five beautiful colors and looks as good on a bookshelf as it does on your nightstand or desk. If self-development is your goal for the near future, the Happiness Planner may be a good option to remind you that tasks aren’t always as important as big-picture life stuff. What’s the best undated planner out there? For those into art, it’s “an easy choice for all illustration fans, featuring a different artwork from Lizzy Stewart in each weekly spread,” writes Nina Alexopoulou at InconnuLAB, an Italian slow fashion brand. But the planner is great for just about everyone, artist or not, who values creativity and flow over structure and boxed-in planner formats. The Little Otsu takes a whimsical approach to undated planners, replacing the subdued, minimalist covers and layouts of aforementioned planners with the colorful, eclectic drawings of London-based artist Lizzy Stewart. The planner has been released once a year and this edition, the tenth, features seaside-scapes and architecturally focused drawings and scenes that bring to mind a fun European holiday, which can be motivational in its own right. The Little Otsu planner features monthly and weekly sections, plenty of space for notes and helpful reference lists to keep track of information like dates, wifi passwords and personal information (just don’t lose it!). 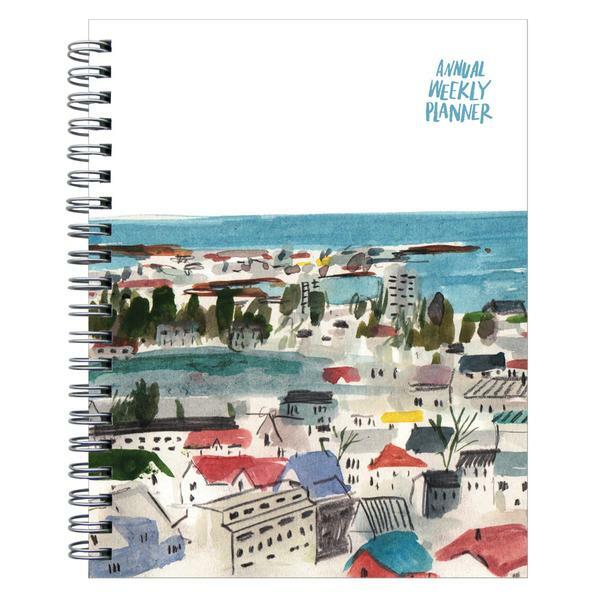 With handy wire coil binding and beautifully designed pages, the Little Otsu Weekly Planner is as much art as it is life planner, and it’s attracted users worldwide because of that approach. 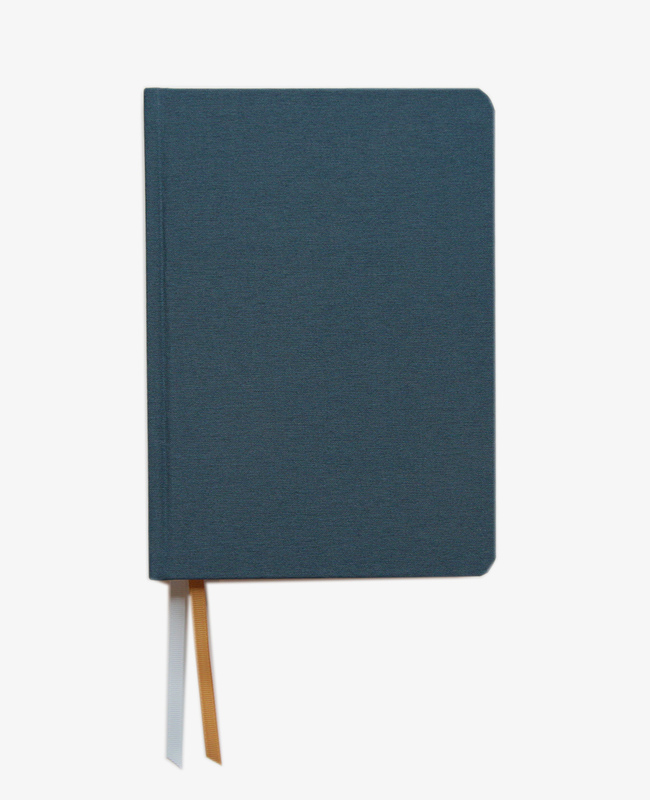 We move now from whimsy to simple with the Minimalist planner from Action Publishing. Made in Colorado, the Minimalist planner is designed to get rid of the clutter, bells and whistles of today’s more popular organization products – and apparently they’ve hit the sweet spot. “Action’s day planners are used by nearly a million people worldwide. We believe that the power to improve ourselves, our relationships and our world resides in each of us,” says the company. 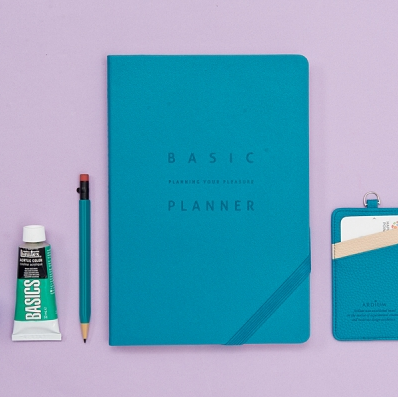 And we’re in no position to argue: the Minimalist planner is one of Amazon’s top-selling planning products, and more than 60% of all reviews gave the Minimalist a 5-star rating at the time of this article. The Minimalist includes a 13-month layout with dot-grid, undated sections for each day. Users find this particularly useful for note-taking and bullet lists. There’s a goals/vision area, but other than that, it’s all about having the room to plan, organize and manage your time accordingly. 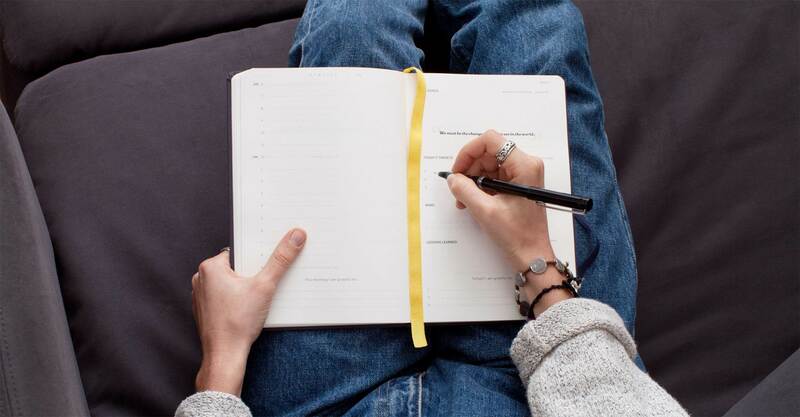 The planner may be best for those who know what they need done and just need a near-blank canvas to get it all out there; if you’re looking for a lot of support, structure and motivation, the Minimalist planner might fall short of your expectations. The Minimalist is available in a medium and large size, and each offers helpful lay-flat wire binding connecting two rugged and durable exterior covers, so it’s tough when it needs to be. The Law of Attraction planner embodies this very philosophy, and offers a life planning solution that’s part planner, part life coach. 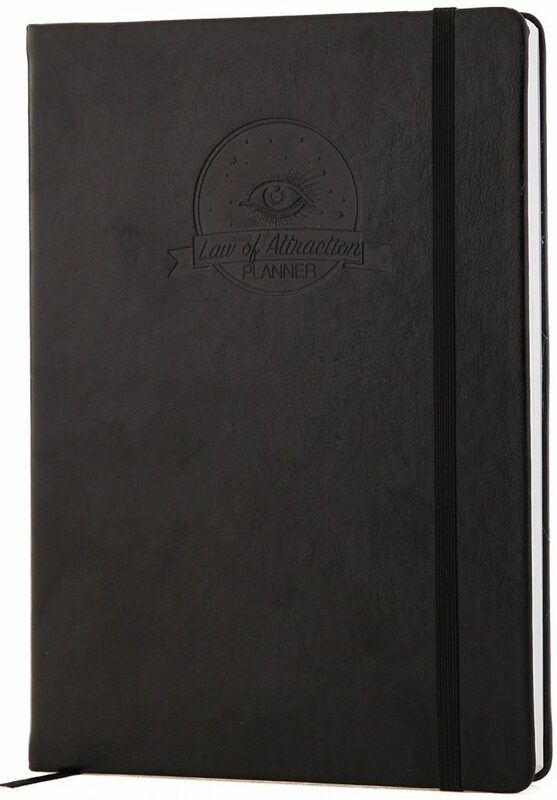 In the same way that the Passion Planner focuses on big picture goals, the Law of Attraction planner operates on the premise that organization and planning is a result of positive habits, attitudes and confidence. The A5-sized hardcover notebook offers undated weekly and monthly planning sections, as well as more motivational features like a Law of Attraction roadmap and plenty of areas to gauge and reflect on your progress. The planner’s goal is not just to help you achieve your goals, but to find life harmony in the process, so that you aren’t pulled every which way by your ambitions and projects. According to the makers of the planner, it takes between 66 and 90 days to make something a habit, so the planner offers routine “positive habit maker” reference areas to make sure that what you want to improve upon is what you’re making a habit of. Sections for things like mind-mapping, victories, gratitude and rewards for achievements gives the planner a vibe that supports progress and milestones while making you feel good about small wins. Our favorite feature of the planner is the daily section that allows you to write a goal for the day and the top 3 priorities. We find this a particularly useful way to take all the stuff going on in your day and boil it down to the essentials. If you’re a fan of motivational books like Think and Grow Rich, The Secret and similar titles, you’ll enjoy using the Law of Attraction planner to get your life where you’d like it to be. 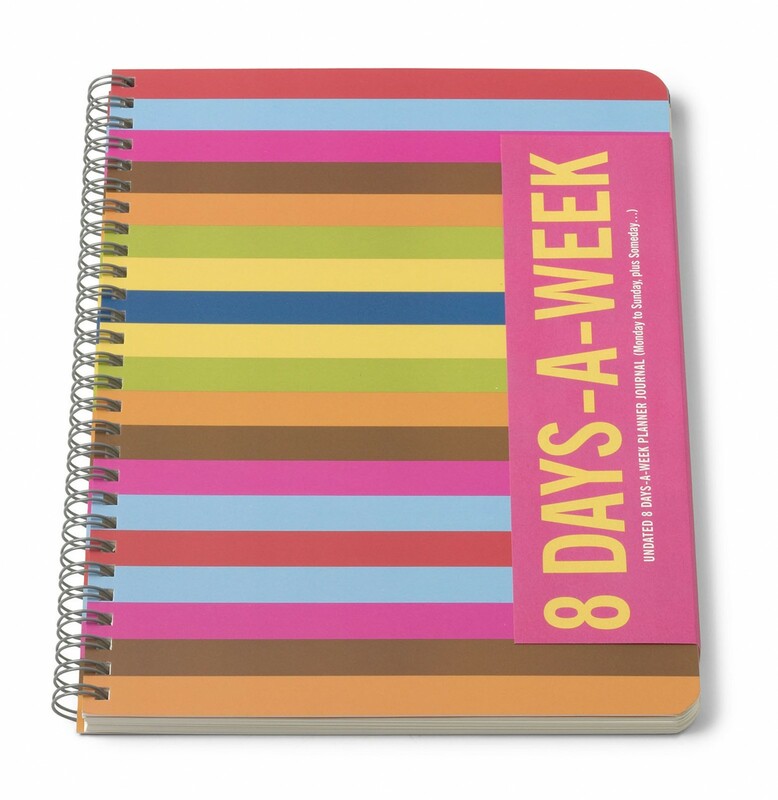 For a no-frills, columnar-style undated planner, check out the 8 Days a Week planner from Bob’s Your Uncle, a Boston-based gift company founded by graphic designer Martin Yeeles and his former shoe designer wife, Michele. This planner gets right down to business: no craziness, no motivation, just the daily input and output of what’s going on in your life. The 8th day of the week represents “Some Day,” a separate column to daydream, make goals or whatever it is that floats your boat (just don’t put that off for too long!). The 8 Days a Week planner breaks up days into 30-min slots, so it’s more like a traditional planner than most here. It’s good for a year, though because it’s undated you can use it for longer if you miss days and weeks here and there. Simple wire bounding and high quality pages make this one of the more visual planners on our list, and its simplicity strikes a cord with those who want to keep things neat and to the point. This simple black-and-white planner from Planner Pad is an ideal choice for busy professionals or executives who don’t need the motivation of the more elaborate planners. In many ways this is one of the most traditional undated planners out there, but for its lack of color and pizzazz you’ll get clarity and organization when it matters most. Sections for weekly goals, appointments, notes, experiences and expenses make this an ideal undated planner for business travelers or anyone else with a packed schedule who wants to break up their daily to-dos into manageable chunks. For those who can’t tote around a colorful motivational poster-in-a-planner around the office, Planner Pad has the perfect solution. We’ve covered 100-day journals, year-long planners and everything in between, but if you’re looking for a burst of organized productivity, consider the Commit30 Undated Planner. Their philosophy is that big goals are attained through accomplishing smaller ones, and that’s easier to achieve when you break your time into manageable sections. There are all types of 30 day challenges out there, from professional to dietary and fitness-related. 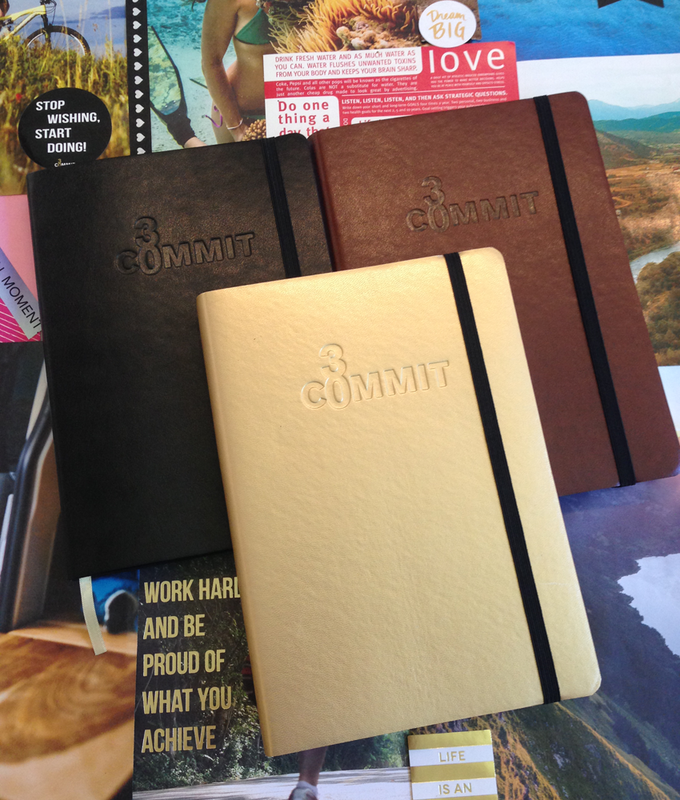 The Commit30 journal can work with any of these goals – and more – and offers a solid framework for turning things around (or speeding things up) all within a month. Each weekly section has a to-do list for life and work, as well as a goal section to outline what you’d like to accomplish that week. If you feel like your days and weeks slip by all too fast without reaching your goals, you’ll find the Commit30 planner does a good job of holding you accountable for how each day passes. Project planning, self-reflection and goal evaluation sections help keep you on task, and many users say that it’s easy to get the hang of consistently using the Commit30 planner, even if you’re not a planner person. Vision pages and a Commit30 Challenge Tracking section make it easy to see if you’ve hit your marks after a month – and if you don’t, then you can easily identify your wins, losses and things you need to change for the month ahead. 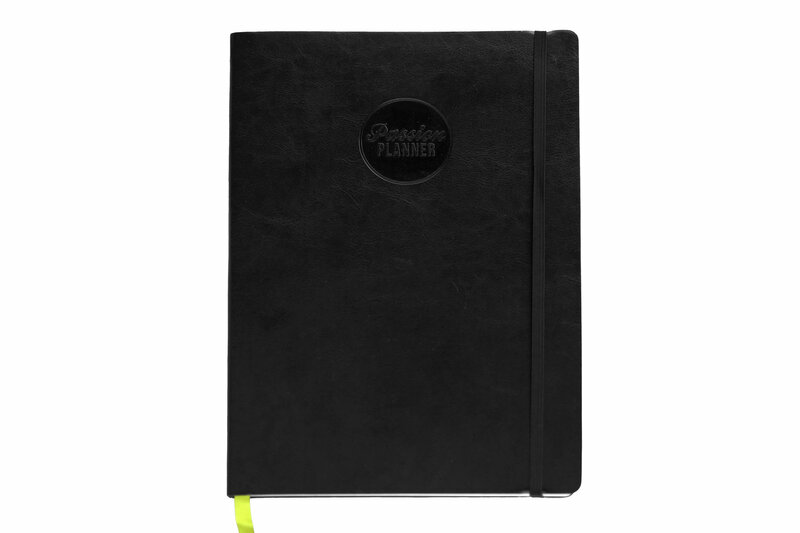 The planner is simple, combining the black-and-white elements of the Planner Pad with the motivational structure of the Passion Planner. It offers weekly and monthly spread to keep track of goals and progress, and provides thoughtful areas to reflect on the time and work you put under your belt. Particularly helpful is the way the planner helps you identify goals – or intentions – and then figure out steps to achieve those goals. Many times, we focus on the big picture without figuring out the roadmap to get there, and the Porpoise Planner helps break this process down and provide a timeline in the process, because deadlines are often key to fulfilled goals. Note sections for recording what went well and what didn’t can help you build on successes and avoid mistakes and setbacks that occur from time to time. The planner offers a year of simple organization surrounded by helpful features that aren’t overwhelming or too over-the-top. It might not be the most innovative undated planner on the market, but it gets the job done, and at the end of the day, that’s what matters. 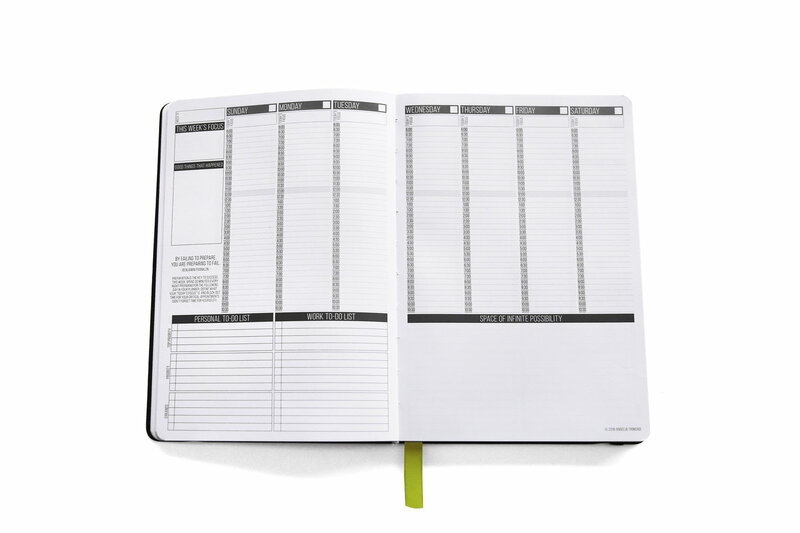 When you want a planner that does what it says, check out the MochiThings Large Basic Planner. It’s large (though other sizes are available), it’s basic – and it plans things, with a yearly plan section, a yearly checklist and all sorts of monthly and weekly progress sections along the way. It has a handy free-note section in the back of the planner that comes in grid, blank or lined style, so you’ll never run out of somewhere to jot down what’s important. The month, week and day sections offer minimalist formats that allow you to focus on the important things, and this planner has one of the cleanest day formats we’ve seen. The Large Basic Planner covers 13 months, or 392 days, and provides a clean, simple format to get organized. 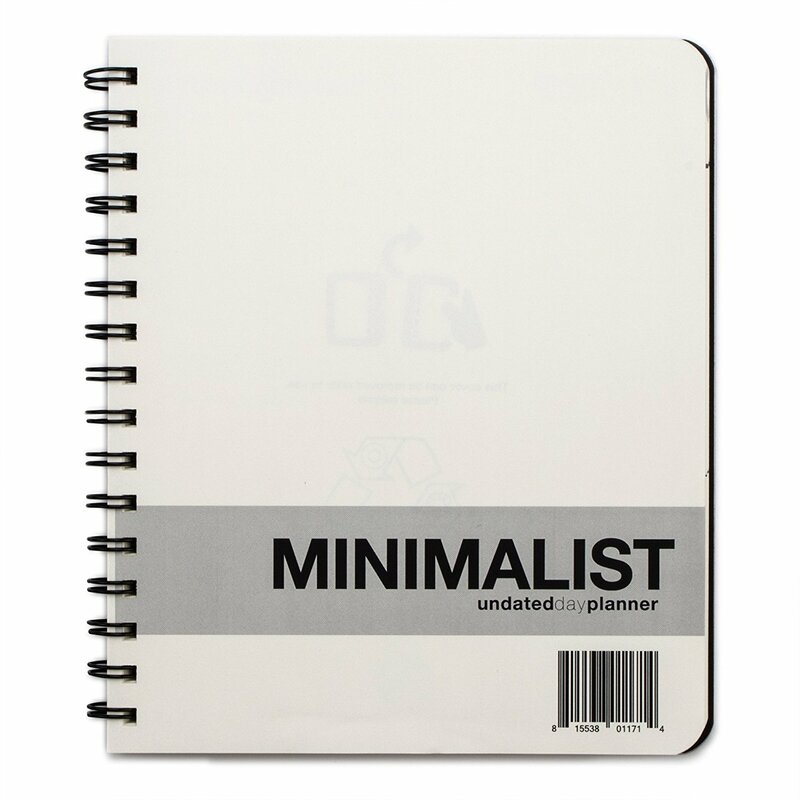 It joins the ranks of the Minimalist planner by Action Publishing as one of the finest low-key undated planners available. The Top Down Planner embraces the concept that everything filling your days, weeks and months begins with your foundational goals. So instead of making your planner look like a schedule of to-do lists and appointments, this planner makes sure that you don’t forget your big-picture vision. Users love the format of the planner: it’s structured enough to get your time managed and organized, but doesn’t feel still and inflexible. There are helpful sections for setting goals, logging gratitude statements and mapping out creative ideas and endeavors. A two-step process allows you to hone in on what matters each week by 1) declaring your success and gratitudes for the week, then 2) plan the week’s goals based on those ideals. 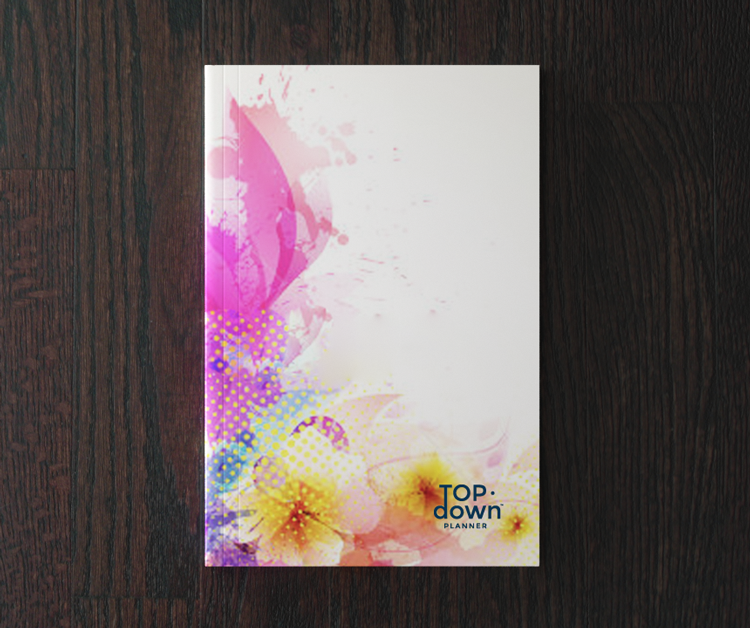 The Top Down Planner is available in four colors, from professional blue for those looking for something subdued, to abstract art covers that pop and shine.